Expect the Unexpected is our motto at Spring Mews student accommodation! 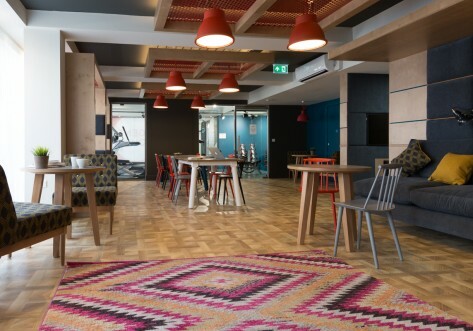 It’s all of the great finishing touches – not to mention the swimming pool, gym and amazing social spaces including study spaces which make Spring Mews the perfect place to live for students in London. We’re located in zone 1 – just minutes from the tube and just off the banks of the River Thames. 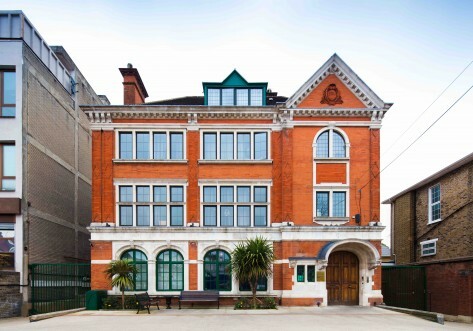 We have easy access to a huge variety of London Universities. We have a choice of rooms available, so you can share an apartment with friends or make new ones, or have your very own en-suite studio. Whichever room you choose, it has been stylishly designed to include great storage spaces, small double bed, spacious work areas and a sparkling en suite shower room. Rent is inclusive of all bills, free WiFi and contents insurance making budgeting easy. Plus the Swimming Pool and Gym are also included and we have tons of social events happening every week. It really is the place to be in London! Located in zone 1. We’re just minutes from the tube, just off the banks of the River Thames, and with easy access to a huge variety of London Universities including Kings College, Imperial, University of the Arts and Southbank. Within walking distance to London’s Southbank and all that London has to offer! This is a great value choice, with your own en-suite shower room, single bed, loads of storage and sociable living in the shared kitchen and lounging area. 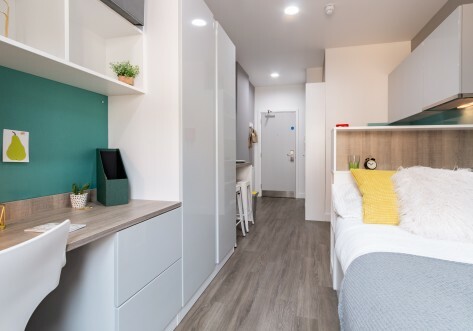 Great affordability and now with a small double bed alongside your own en-suite shower room, study area, ample storage and cooking your own meals in the shared kitchen/living room. All our usual fab features; take in the small double bed, shower room, ample storage and study area. Then off to the shared kitchen and social space when feeling peckish. Self-contained studio living starts here for you and perhaps your plus one. If you choose to share the en-suite shower room, small double bed, storage, fitted kitchen and study area, there’s no more to pay. This beauty of a studio, even bigger than the Silver but with the same quality features and fittings, comes with space guaranteed. Ideal if you’re alone and like to spread out or there’s room enough for two to share. There’s no additional charge if couples share a studio. Contact the site team for more info. Super social living in a stylish flat. You’ll have everything you need, from a fully equipped communal kitchen and cosy living space (that comes with a 43 inch Ultra HD TV! ), to a lovely bedroom and access to a modern shared bathroom. Everything you need in one flat, shared living just got awesome. You can enjoy a state of the art communal kitchen and stylish social space, equipped with a 43 inch Ultra HD TV. Your bedroom is super cosy and comes with a modern en-suite. 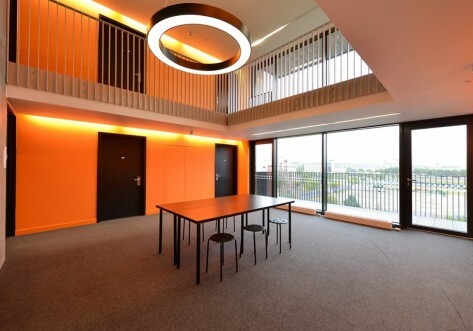 Love your luxurious and social life in this flat. With a cosy bedroom and modern shared bathroom, not to mention a fully equipped kitchen and social space (with a 43 inch Ultra HD TV! ), this is the ultimate pad. Did we mention you have access to a lounge balcony? Built especially for two, consider this modern flat home and share its awesome amenities. You will have your own bedroom and private en-suite, with access to a shared state of the art kitchen and stylish living space, quipped with a 43 inch Ultra HD TV and lounge balcony. Luxury living at its finest and it’s all for you. Enjoy this modern flat, equipped with a state of the art kitchen, stylish and comfortable living space and spacious bedroom. With a 43 inch Ultra HD TV and lounge balcony, consider your ultimate lifestyle sorted. Check out our website or give us a call for more information on our offers.